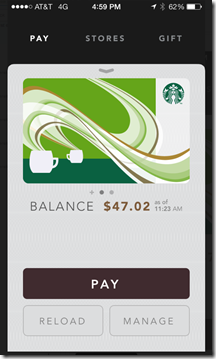 In a major update last week (v4.3.2, 30 Jan 2017), Starbucks added a floating balance to its mobile app main page. So instead of navigating to the pay tab within the app, users always see their card balance as soon as they launch the app. And the balance stays floating in the lower right corner no matter how far down the page you scroll. It’s a small thing, but it helps users know before they get to the front of the line whether they have enough funds in their prepaid account. It is also a good shortcut to the card reload function, though I’m not sure how many users will know/remember it’s there. Bottom line: Banks should make sure that the balance is visible on all areas of their debit card interfaces. It’s an even worse user experience to find out you don’t have the funds after you’ve ordered your meal or rung up your grocery store purchases. Australia’s Bendigo and Adelaide Bank (Bendigo) has long been known for its philanthropy. Its Community Bank branches, which enable local communities to own and operate a Bendigo Bank franchise, have contributed $125 million to local projects and charities. At FinovateEurope 2015, the Australia-based bank debuted redy, a mobile payments platform with a charitable element developed specifically for Bendigo by its subsidiary, Community Telco Australia. Redy positions itself as a community ecosystem more than a payment ecosystem. The local rewards system enables customers to earn creds (points) for every transaction on the redy platform. Creds add up to 0.5% of customers’ transactions, and can be donated to local charities or causes, or used in exchange for a discount toward a future purchase. By offering customers an easy way to give to causes they care about, redy helps small businesses connect with customers. To begin using redy, Bendigo must first approve the merchant and set them up with a business account and a redy point-of-sale tablet. Redy charges merchants a membership fee of $25 per month and a transaction fee of 1.5% of each purchase, 0.5% of which is returned to the customer to use as creds. The creds system offers businesses a way to encourage repeat spending and gives them an easy way to support local campaigns and charities. Merchants also receive access to reports and analytics of transactions on the redy platform. Customers download the free redy mobile app on their iOS or Android device, and link their Visa, MasterCard, or Bendigo savings account. When ready to pay at a business that accepts redy, the customer enters their PIN, scans the QR code on the merchant’s tablet, and confirms the payment amount. The payment is secure and does not transfer the customers’ financial data to the merchant. The redy system sends the customer a digital receipt. The creds the customer earns from the purchase are automatically credited to their account and ready to be donated or applied toward a repeat purchase. Charities that register with Redy can tap into the pockets of Redy shoppers, who may opt to donate their creds to causes that matter to them and their community. Bendigo and Adelaide Bank debuted redy at FinovateEurope 2015 in London. Onlinepay.com has created a mobile wallet for shopping, topping up online accounts, and P2P payments. The app, which it debuted at FinovateEurope 2015, launched in the Apple App store last December. Users browse items in the in-app shopping mall. When they find something they’d like to purchase, the entire transaction is handled within the app. E-commerce companies partner with OnlinePay to add a button to their checkout flow that enables customers to pay using their mobile wallet balance. 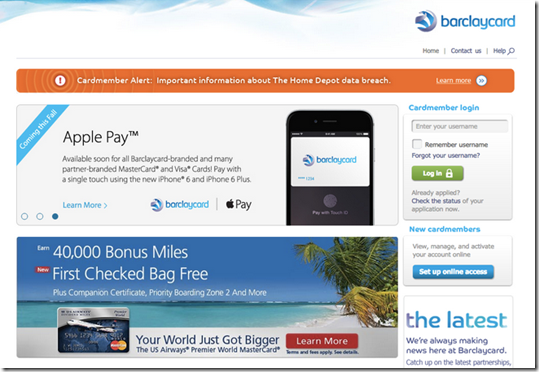 Retailers can also send targeted offers such as the one above. Similar to Venmo, OnlinePay makes P2P payments social by enabling users to share their payment history with others. An activity feed broadcasts to the entire network of OnlinePay users or just to their group of friends. Users can elect to keep their payment activity private. With the Services tab, users top up Forex trading accounts or purchase online gaming components, which are instantly applied. Users are not require users to exit their Forex trading application or leave their game to make purchases. The company offers 24/7 chat support to resolve any issues. Users can also use the feature to chat with their friends. OnlinePay debuted its mobile wallet at FinovateEurope 2015. Living in the epicenter of the Starbucks empire, I have followed the caffeine-dispensing giant closely since the beginning. What I would not have guessed 20 years ago, is that it would emerge as a payment pioneer. First, the company was at least five years ahead of its time with gift cards. Now, it’s doing the same with mobile payments/rewards. And Starbucks continues to innovate. Just this week, the company widened the beta rollout of its remote ordering option, Mobile Order & Pay, to 650 stores in the Northwest. And luckily this includes my home turf in Seattle, so I had a chance to use the service on its first and second day (March 17 & 18). It’s no gimmick: There are real user experience and operational gains. Unlike Apple Pay, or even the Starbucks app, which arguably take longer than a simple credit card swipe, there is a material time saving for the mobile order & payment process. Once your drink order is saved (see screenshot below), it takes only about 15 seconds to order AND pay. Even if there were no queue (unlikely), that’s still a significant time savings over the usual ordering process. And the labor savings over time could be significant, especially in relatively high-wage areas, such as Seattle where the minimum wage is scheduled to move to $15 . Pushes usage to stored payment credentials: There’s a reason why Starbucks added “Pay” to the name. They clearly like making the payment invisible. In the past, I’ve opted to top up my Starbucks account (via credit card) at the counter, since I was there ordering anyway. Now, I’m going to do all that in the mobile app. 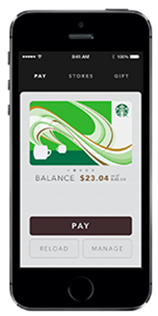 Again, another labor savings for Starbucks and an opportunity for issuers to make sure their card is loaded into the Starbucks app, PayPal, or in Apple Pay, since those are all reload options. The app shows 3-minute window when order will be ready along with driving directions. Previous orders are saved in the app for quick reordering. Well, that was anticlimactic. But I knew it would be. Between Starbucks mobile, Square Wallet, Google Wallet and my Discover Card contactless sticker affixed to the back, I’ve made a few hundred in-store purchases with my phone. So smartphone purchase #247 today was hardly remarkable from a UX standpoint. The only thing that would have made my first Apple Pay experience interesting would have been if it failed (resulting in a much more clickable headline for this post). But although it took three tries (note 1), the phone finally vibrated (the same as my Nexus) telling me that Apple’s NFC magic had indeed triumphed (note 2) adding 1.05 cent to its Q4 numbers (note 3). And although I firmly believe we are at “peak plastic” for debit/credit cards and payment via the cloud is inevitable, I don’t see how Apple Pay adds 15 BPS (or a half-cent for debit) of value to the card-using experience. But to play with Apple you have to pay. And 15 BPS is a lot better than the 30% interchange Apple has collected for the past six years on in-app purchases. So I’m neither criticizing the rumored economics, nor the 500 issuers who have signed on. For competitive reasons, you might as well play along (or not, see previous post). 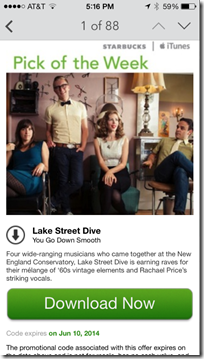 Bottom line: I’m not giving up on plastic, or merchant-specific apps like Starbucks (or MCX? ), quite yet. The iPhone/TouchID experience is great, but at this point, it’s slightly more cumbersome than plastic (note 4) and costs more if you account for my tendency to drop the phone (note 5). And Apple Pay’s consumer value for in-store purchases will come in the future with more integration between phone, bank and merchant (note 6). Getting customers to give up plastic is all about the three R’s: rewards, receipts, and relationships (note 7). Starbucks has nailed it (note 8). Apple has not, yet. 1. The first time I put the phone next to a terminal, nothing happened when I authenticated with TouchID. I’m not sure if it was my phone’s failure or the cashier failed to ready the charge properly. The second time, it did connect, but I was declined with a negative “buzz” from the phone. The cashier readied the charge a third time and this one went through with a pleasant vibration and push notification on the screen. These things happen, even when swiping plastic, so I don’t hold it against Apple Pay. That said, were I a so-called normal consumer, I probably would have pulled out my plastic and waited for Apple Pay 2.0 next year before trying again. 2. Sadly, I still had to make chicken scratches (aka my signature) on the Verifone display at Bartell Drug for the $6.99 box of tea and also have a paper receipt shoved into my hands. 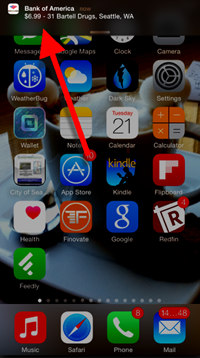 It’s not Apple’s fault, but it does detract from the overall UX. 3. My $6.99 purchase times the rumored 0.15% interchange rebate to Apple. 4. I’ve been using TouchID only a month, but so far, I find it clumsy. I have three fingerprints registered, and some work better than others, and overall, I find it can take numerous attempts to get it to authenticate. This is not something I want to experience at the front of the checkout queue. It’s bad enough that I’m standing there waving my new $600 gold smartphone at the terminal. I don’t need to be holding up the line while I fumble with said device. Once the novelty wears off, I’ll probably go back to swiping plastic, at least if there’s a queue. 5. In addition, every time I pull my phone out, especially when juggling purchases at the point of sale, there is a chance I’ll drop it. And since I detest cases, I crack my screen every year or two. Assuming it costs $100 to fix, and I crack it once every 5 to 10,000 times I handle it, it’s cost me 1 or 2 cents to use my phone in lieu of plastic. 6. This post is about the physical point of sale. The one-click mobile-payment process for Apple Pay-powered shopping carts and apps has immediate and understandable value for both the consumer and merchant. 7. You could argue that the increased security from phone payments will move people off plastic. But consumers still do not trust mobile phone security, for good reason. And they know they are covered for plastic security breaches. So the known threat (plastic) probably trumps the unknown (phone) for the time being. 8. And the Starbucks experience gets better next year when “order ahead” goes national. 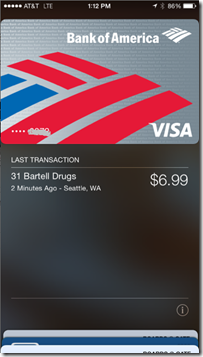 If all goes well, some time within the next week Apple Pay will be up and running. Short-term it won’t cause a ripple in market share or consumer behavior (see previous post), but long-term it is likely to be seen as an important mobile-payments milestone. Regardless, I look forward to using it. But with only a couple contactless terminals in my usual Seattle haunts, I guess I’ll be buying lots of coffee at Peet’s and Tully’s while I test it. 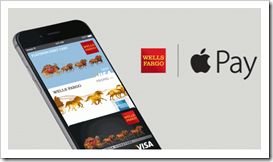 The subject for today is what banks are and aren’t doing to ride on Apple’s mobile coattails. 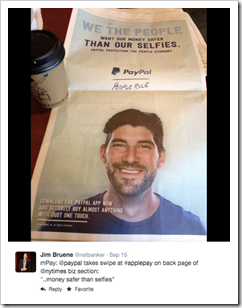 There has been little FI marketing so far, other than PayPal’s NY Times full-pager poking fun at it (15 Sep 2014, see inset). And some media buys from Visa and MasterCard. 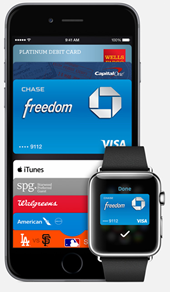 Eleven financial institutions were named on 9 Sep 2014 at the official launch of Apple Pay: Six major launch partners listed below and five “coming soon” issuers (see note 1). The big six have been almost silent since the first week when four of the six issued press releases, emailed customers (note 2) and/or posted promos on their websites. Issuers may now be gearing up their marketing machines, which were caught relatively unaware last month, due to Apple-prescribed secrecy, for a pre-holiday Apple Pay push. However, I would not be surprised if major issuers, who’ve already seen contactless card-usage fizzle, take a wait-and-see approach for the remainder of 2014. In any event, it will be interesting to watch. 1. 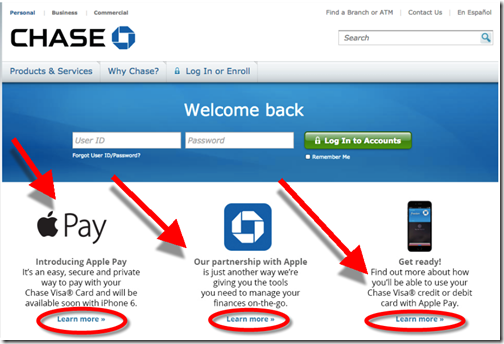 The five other issuers mentioned at the Apple launch were: Barclays, Navy Federal Credit Union, PNC, US Bank, USAA. 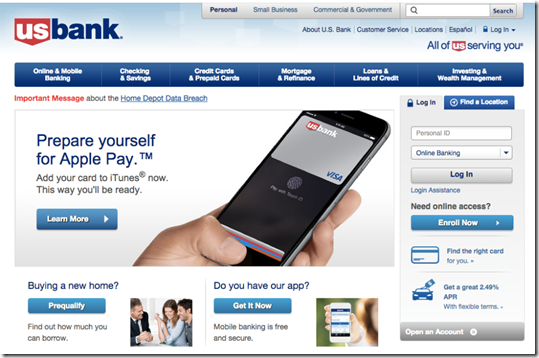 Yesterday, Arvest Bank announced it was supporting the system as well. 2. 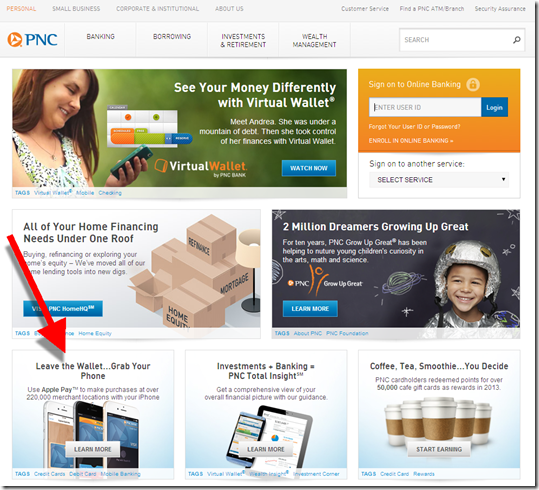 Despite having 10 card accounts (four business and six personal) across the six launch partners, I have received emails only from two (Wells Fargo on 11 & 19 Sep 2014 and Capital One on 12 Sep 2014). When I moved to Seattle, Starbucks had just four locations. So I’ve had a ring-side seat in their climb to worldwide ubiquity. Though not a huge fan of their coffee, I greatly admire their business model, technology, and payments innovations. While this process seems ridiculously time-consuming compared to a card swipe (or cash), if you are waiting in a queue (typical), you can take care of all that before your turn to order (especially if you already have your phone out and are logged in). 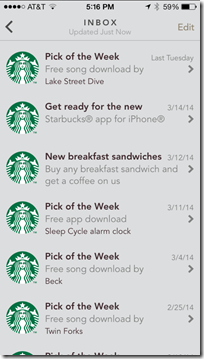 The latest version of the Starbucks mobile app (iOS released 20 March 2014) cuts two steps from the 10-step process. 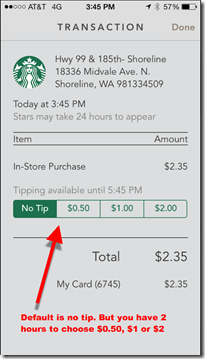 More importantly, the crucial “hit pay” (step #5 above) has been replaced by a shake of the smartphone to signal it to display the Starbucks QR code needed at the point of sale. While not a huge timesaver, it pretty much eliminates navigation within the app before payment, quite an improvement in UX once you get the hang of it (note 2). The new app also offers electronic tipping, a welcome improvement for the staff, since the move to no-signature card-transactions many years ago took away credit-card tips. B. Loyalty program: A screen-dominating donut shows exactly where you stand on the path to the next loyalty level. Focus: Go to Starbucks.com on your desktop browser, and you’ll see about 150 navigation choices delivered via mega-menus across six main tabs. It’s worse than most bank websites. However, the mobile app has just three primary navigation choices (Pay | Stores | Gift), plus rewards, messages and transactions on the main screen. 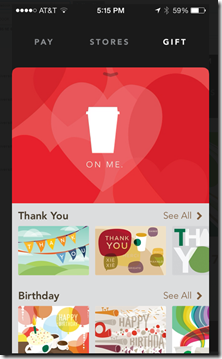 Starbucks rightly chose to concentrate on exactly what customers need when they are on the go. 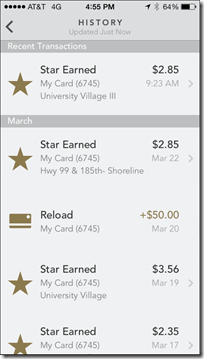 Integrate rewards/loyalty: Despite the “shake to pay” process improvement, the Starbucks mobile payment experience is still cumbersome and by no means easier than paying by card. However, because the app is integrated with rewards, all of sudden it becomes compelling, both for early adopters (certainly) and the mass market (note 3). Annotate the transaction: Besides the new tipping function, the transaction history includes both a feed of the transactions (screen #6), plus the ability to click through to a full receipt (screen #7). 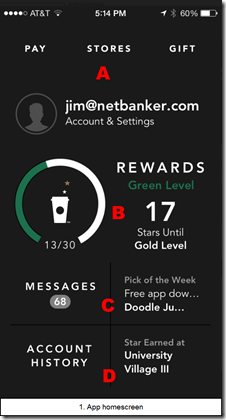 While not super interesting at Starbucks, when so-called “level 3” data is available for more complex purchases, it becomes an important part of the value delivered. Mobile first: If you offer information or services consumed on the go, mobile services (app & website) are the key interaction point going forward. Starbucks CEO Howard Schultz understands this (note 4). Does your CEO? 1. Previously, I was paying with Square Wallet since no reloading is required. But now I’m on the quest for Gold Status at Starbucks, so Square will have to take a backseat. 2. Since users are not accustomed to shaking their phone to make it do something, it may take a while for everyone to figure out this shortcut. Luckily, the Pay button has been moved to a position of great prominence, for those that prefer to use the old navigation process. 3. The Starbucks app is now on my wife’s iPhone. Besides the map, weather, Yelp, and French translations, it will be only the fifth app she uses frequently. 4. Starbucks CEO Howard Schultz is a genius and seems to genuinely care about his employees and the world. If he had only stayed out of pro sports ownership (go Sonics! ), his record would be virtually untarnished.